Pinktoe tarantulas colour ranges between dark black to metallic grey with reddish to violet hues on the abdomens and legs. 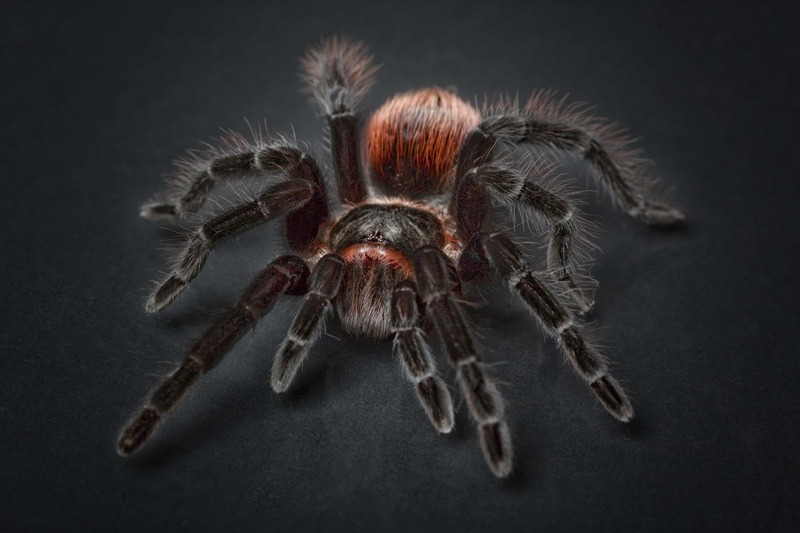 The tips of their hairy legs are pink, giving them their name, pinktoe tarantula. A fully grown pinktoe tarantula measure between 4.5 to 5 inches. 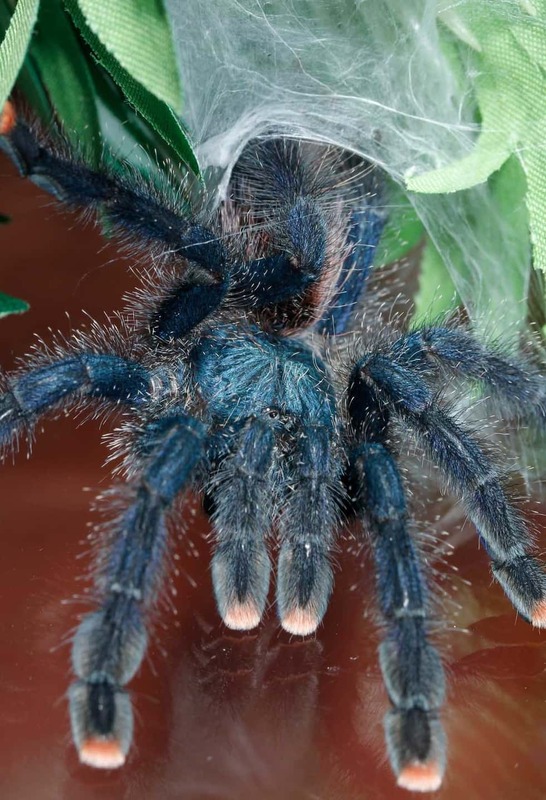 Also known as the Martinique pinktoe, the tarantula is docile and attractive from its unique coloration. This has made it a popular spider pet. Pinktoe tarantula is native to Dominica, Guadeloupe and Martinique in the Caribbean Sea. The area is high in humidity all time of the year. The Antilles tree spider is an arboreal (tree-dwelling) tarantula by nature. It prefers to live in live plants and tree barks. It blends in black tree hence the trunk pattern on its abdomen. Pink toe tarantulas feed on crickets, flies, moths and other large insects. 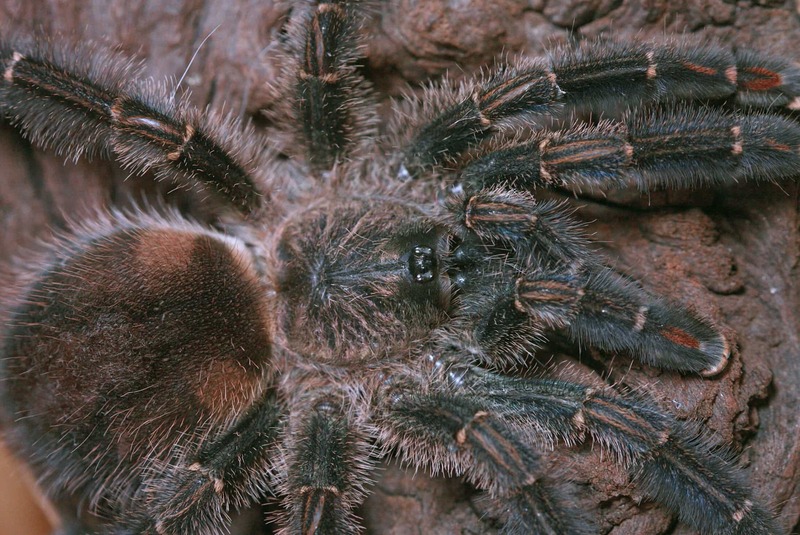 Occasionally, the tarantula can feed on pinkie mouse and small lizards. The spiderlings feed on pinhead crickets, flightless fruit flies and other small insects. The average lifespan of a pinktoe tarantula is 4-8years. Males live between 2 to 3 years with female living between 8 to 12 years. The mating period of pink toe tarantula is best after 4 to 6 weeks following moulting. This is to ensure the eggs get fertilised. If in captivity, it’s advised to first feed well the female before introducing the male otherwise he gets turned into a meal. Preferably, cage them apart but within a range to observe their reaction. Pinktoe enclosure needs to be large and vertically oriented. Add 2-3 inches of potting soil, peat moss and some wood chips. The humidity should range between 65 to 75 %. The ventilation should ensure the listed humidity and doesn’t encourage the growth of bacteria. Place a shallow dish of water. The temperature should be between 78-82 degrees Fahrenheit. The setup of the enclosure needs plenty of objects for the pinktoe to climb around. Due to its arboreal nature, the tarantula will make the web closer to the top of the enclosure. To avoid destroying the web, have a house with a door that opens on the sides. Martinique red trees spider, Martinique pinktoe, Avicularia Avicularia, Antilles pinktoe. The Antilles pinktoe growth rate is fast. In the natural habitat of the pinktoe tarantula, the temperature reaches up to 28 degree Celsius at day and 20 to 25 degree centigrade at night. If kept in captivity, the enclosure should imitate such temperatures. Let the light in once in a day to control humidity. Eggs need a temperature of between 26 to 29 degrees centigrade. The Martinique tarantula is a docile, active and fast moving spider. When disturbed the spider will flee away, at first. However, with persistent provocation, the tarantula will use its urticating setae. As per spiderlings, they prefer to live closer to the surface. Sometimes thy will jumps on you as you clean or feed them. However, worry not they won’t bite, probably. If you get a bite, you will probably get a small pain or a burning sensation. Only someone with an allergic reaction to the bite faces a potent threat. After a successful mating, the female Antilles pinktoe will create an offspring of between 80 to 175 spiderlings. She will make the cocoon 3-6 months after mating. Get the cocoon and keep it in a 100% humidity and in a temperature range of 26 to 29 degrees. Spiderlings feed more often, so feed them between 2-5 times per day.